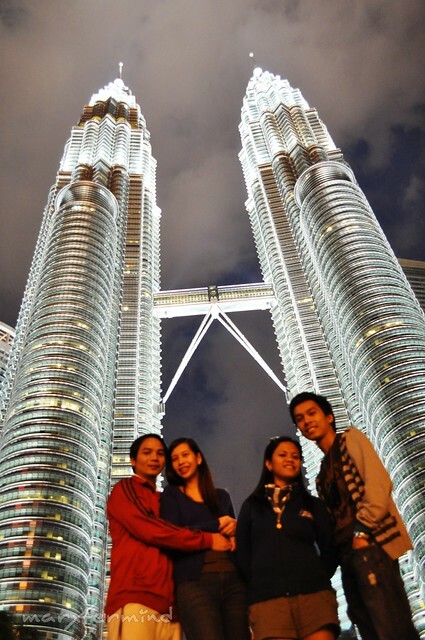 Whenever I heard of Malaysia, the famous Petronas Twin Towers always popped up into my mind. As a matter of fact, when we reached Kuala Lumpur, I looked for it first. And it doesn’t fail me to see the famous tower as it was very apparent everywhere from the city central. We arrived at the KL Sentral at around 7:30 PM from Genting Highlands. Then we took a Putra Line train going to KLCC station. From the station, we went out through Suria KLCC, a shopping mall. 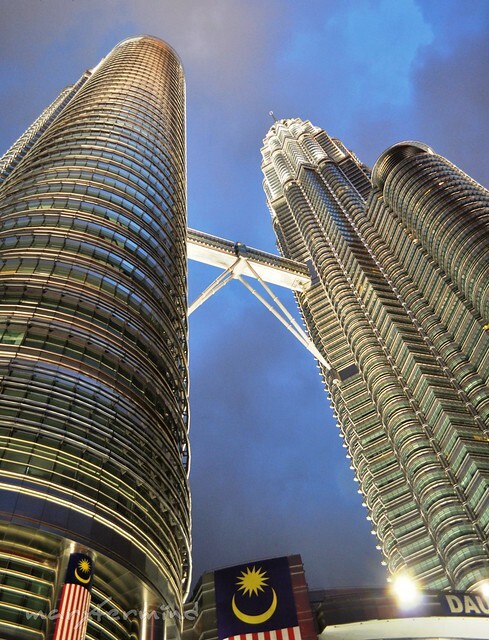 Beside Suria KLCC are the Petronas Twin Towers. We were really excited as soon as we get into the area. My companions started to take pictures as I was still looking for the best shot of it. I was looking for the lake similar to what Chyng have but I failed to see it. But anyway, still the towers are really sparkling. It was dazzling and just really amazing. I couldn’t help myself but be amazed how dazzling it was. A lot of people were scattered around so there’s no chance to take a picture of the towers alone. I wanted to have a picture of myself doing some tricks with the towers but I couldn’t think of any tricks, so we just ended up having a group picture of us. Before we left, I met Mica, a blogger. 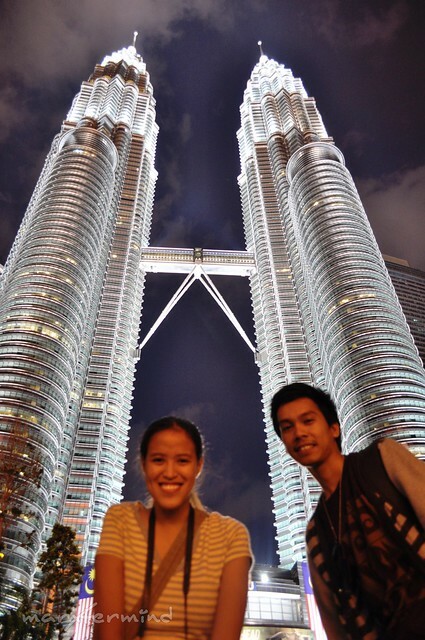 Since she was also in Malaysia that time for a trip, we thought of having a meet up at least. I was happy to meet her finally! 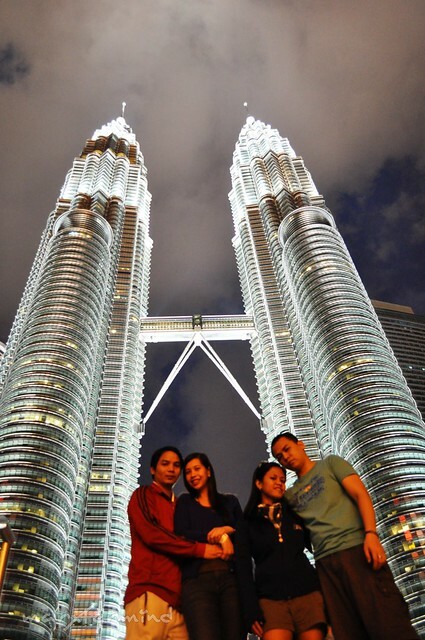 The Petronas Towers is truly imposing… sayang hindi ka nakatawid sa viewdack… at least you got nice and beautiful night shots. 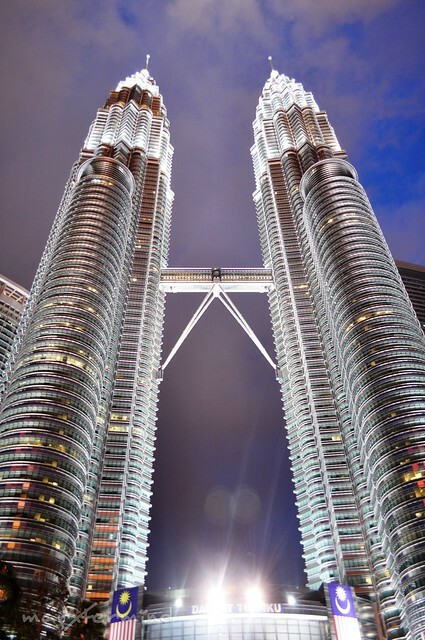 ito lang talaga ang masaya sa KL ang makita ang Petronas Twin Towers. Ang ganda nya talaga kapag sunset! wow! ang ganda nga. nabasa ko dati kay Senyorita Mica yan e. Nandun pa si John Lloyd at BEa sa Teaser pix. hahaha! Ang kulit. Alam mo ba yung film na yun? Ako din minsan nabblanko sa mga tricks. Ang dami kong naiisip pero pag nandyan na ko sa place itself, wala na. Asar no? @pack up and drift, go na! 6 hours bus ride lang naman from SG! @Jeffz, nagreflect naman ung name mo! hehehe! San ung Kuching? yan rin ang unang nasa isip ko pagnaririnig ko Malaysia.. esp KL..
Ang ganda nung first pic. Di nakakasawang tingnan. di ko napopost yung KL series ko. hehe.